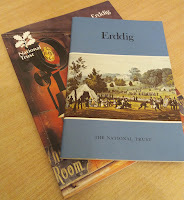 A couple of weeks ago I found a guide book for a National Trust property called Erddig. I love reading about old houses so I bought it - and then promptly forgot about it until a week later when my husband suggested going out for the day - and why didn't we visit an old house he'd heard of called Erddig? 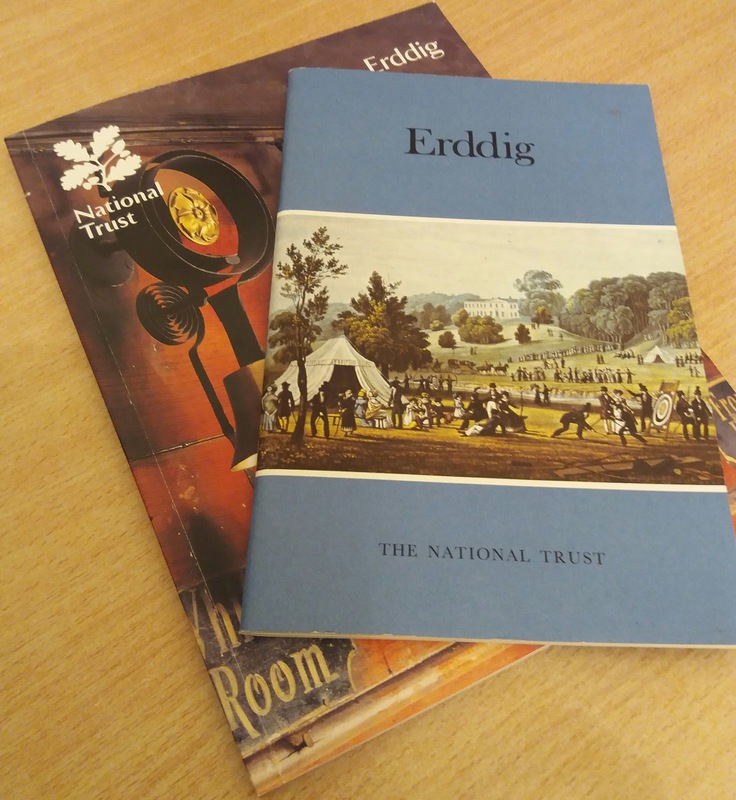 When I showed him the guide book and said what an amazing coincidence that was, he rolled his eyes and pointed out that Erddig was the only National Trust house in the area we hadn't visited! Erddig Hall was built by Joshua Edisbury between 1684 and 1687, two stories high, with a basement and a central cupola. Unfortunately it wasn't long before Joshua was deeply in debt and, although his brother attempted to bail him out, they both ended up ruined financially. The house was bought in 1714 by a lawyer, John Meller, who added the two wings on either side. When he died he left the estate to his nephew, Simon Yorke, and it remained in the same family for the next two and a half centuries. The estate was supported by coal, but the industry was nationalised in 1947 - and then approval was given to mine beneath the house, causing catastrophic subsidence. Despite all the sacrifices made by the Yorke family to keep the estate going, it was handed over to the National Trust in 1973. The front of the house appears different to the back, because it was re-faced in stone in 1772-73. Not due to any particular fashion; exposure to the elements was eroding the brickwork. Erddig is different to other National Trust houses in that you enter through the outbuildings and servants' quarters, rather than the main entrance. This is to appreciate how the owners of the house were very fond of their servants, treating them almost like members of the family. A collection of portraits and verses on the walls provide a fascinating record of those who worked on the estate - although I do wonder how the servants felt about being immortalised this way! The outbuildings include the blacksmith's, a saw mill and joiner's shop. There are also stables and carriage houses filled with old bicycles and vintage cars. Because the house remained in the same family throughout the centuries, nothing was ever thrown away! This 1907 Rover was Erddig's first car. It was bought in the 192os from the chimney sweep, who in turn had bought it from the local vicar! Electricity was never installed at Erddig, and visitors are not allowed to take photos with a flash, so I'm afraid my photos are not of the best quality. But the rooms pictured below were my favourites. I was particularly intrigued to see the dining room, which was remodelled by the architect Thomas Hopper in 1826-7. He was also the man responsible for revamping Penrhyn Castle, one of my favourite places to visit, and the inspiration for Hurst Castle in Nemesis. The pillars hold up the floor above! The library wasn't created until 1775. It had originally been the little parlour. The books came from what had been John Meller's study, and there are more than 1,500 volumes - arranged from right to left! 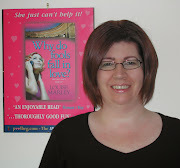 although I'd prefer more interesting books! Chapels always fascinate me but I was particularly interested in this one, because the windows include fragments of 15th century French glass. As we visited Erddig during the 'winter', it meant that some of the rooms weren't open. So that definitely means we'll go back again! What I found most fascinating about Erddig were the people who used to live here; the Yorke family, who always called their male children either Simon or Philip. There was the first Philip (1743-1804), who had such a fear of fire, he built a new kitchen completely detached from the rest of the house. The second Philip (1849-1922) was bullied into marriage by his father; his bride left him shortly afterwards, cadging a lift on a milk float!